Thank God for Cardinal Gerhard Müller. Seriously, please make sure you thank God for Cardinal Müller. Prayers and mortifications would be well offered on his behalf in the coming weeks and months. When Pope Benedict appointed (then) Bishop Müller to head the Congregation for the Doctrine of the Faith back in 2012 it caused a bit of a stir. Some pointed with concern to his previous writings regarding the Eucharist and Mary’s perpetual virginity. None the less, Müller was held in high esteem by his fellow countryman. Following Pope Benedict’s abdication a year ago, Müller was once again confirmed in his role as prefect of the Congregation by Pope Francis. Just this past week he was elevated to Cardinal, one of nineteen men given the red hat by the Holy Father. 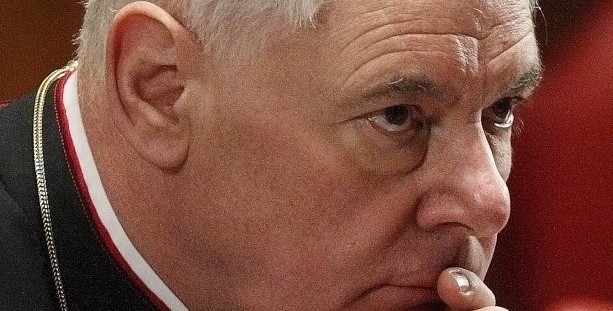 What has become clear in recent months is that Cardinal Müller is becoming the voice for orthodoxy against a growing chorus of dissent within the hierarchy of the Church. With the upcoming Synod on the Family scheduled for later this year, we are beginning to see a very public game of “expectation setting” being played, particularly regarding the reception of Holy Communion by divorced and remarried Catholics. As reported last November: “The (archdiocese of) Freiburg guidance said that a person in such situations can, in consultation with their parish priests, come to a ‘responsibly reached decision of conscience’ and receive the Sacraments of Baptism, Holy Communion, Confirmation, Confession and Anointing of the Sick, and this decision must “be respected” by the priest and the community. (Life Site News, November 14, 2013). On one side are those who recognize the permanence and immutability of the Church’s teaching on marriage and divorce. On the other side are those voices calling for change under the banner of “pastoral concern”. No one has argued more vocally for the latter position than the bishops of Müller’s own native Germany. In October Müller responded to the archdiocese of Freiburg with an official letter which had been reviewed by the Holy Father himself. In the letter Müller reaffirmed that Catholics who have divorced and remarried civilly should not present themselves for Holy Communion. He has additionally expressed concern over the confusion and scandal that would result from the German bishops proposal. What we are seeing waged here is an immensely important battle. It is also a spiritual battle which has far reaching implications for the family far beyond this specific issue. Interestingly, the Freiburg guidance employs the same verbiage used by those Catholics who rejected the encyclical Humanae Vitae upon its release. To argue that a “responsibly reached decision of conscience” is all that is needed for reception of the Sacraments, most particularly the Eucharist, in many ways undercuts the concept of grave sin and even sacramental marriage itself. Openly challenging Rome, despite the unambiguous response from Cardinal Müller, is another German and member of the Congregation for the Doctrine of the Faith, Cardinal Walter Kasper. Publicly stating that the Church rules will soon be changed and that divorced and remarried Catholics will be permitted to receive Communion, Kasper recently said that “Christians who want to live by faith with the Church, who acknowledge that they have made ​​mistakes by the breaking of the first marriage, which they also regret – for them it should be a way back fully to participate in Christian and ecclesial life.” (Life Site News, December 20, 2013). It is interesting to note that none of this is new for Kasper. Back in 1993, when still a diocesan bishop, Kasper and two fellow bishops issued “pastoral instructions” to their diocesan priests advising them to give Holy Communion to divorced and civilly remarried Catholics. Cardinal Joseph Ratzinger, then prefect of the Congregation for the Doctrine of the Faith, forced the German bishops to rescind their policy. “The Second Vatican Council was the main event in the Church in the 20th Century. In principle, it meant an end to the hostilities between the Church and modernism, which was condemned in the First Vatican Council. On the contrary: neither the world is the realm of evil and sin –these are conclusions clearly achieved in Vatican II—nor is the Church the sole refuge of good and virtue. In the coming months Cardinal Müller will be tested. The Holy Father will be tested. Couched within the compelling language of compassion offered by many will be an assault on the truth. The clarity and courage with which the prefect of the Congregation for the Doctrine of the Faith speaks will be a necessity. Pray that orthodoxy will be defended.